There’s nothing like sipping a glass of wine while you overlook the city. Why not enjoy Boston’s beautiful views with a quiet drink? The city’s Seaport District is home to lovely spots, including Sam’s at Louis. Tucked away by the ICA and located atop Louis Boston sits Sam’s. The restaurant itself is sleek and modern with floor to ceiling windows that are perfect for taking in the gorgeous views of the water and skyline. 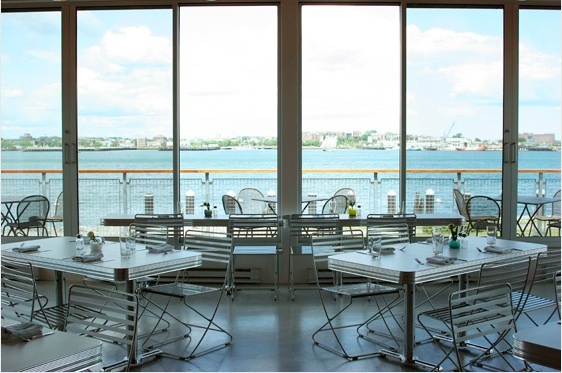 When the weather is pleasant, the expansive deck is flecked with chattering diners, enjoying beautifully created dishes that complement the picturesque view of Boston. Sam’s is the modern lovechild of co-owners Esti and Drew Parsons. After helping to open and manage Rialto and Radius, Esti took her talents to create the contemporary and upscale restaurant on the waterfront. With Esti managing the food, rockstar husband Drew promoting and organizing events, and brother John managing the front of house and beverage program, Sam’s is a Boston establishment that should be in a league of its own. While Esti and Drew have managed to make the stylish eating establishment a perfect spot for drinks and dinner, it is the menu and work of Chef Asia Mei that truly steals the show. With experience at Hamersley’s Bistro, Whole Foods, and the Franklin Southie, Mei utilizes fresh, local, and organic ingredients to create her own twist on “east and west coastal style cooking”. Chef Mei’s menu utilizes local ingredients from suppliers such as Eva’s Organic in Dartmouth and Blue Heron in Lincoln. Her playful twist on fresh fare is the reason this restaurant has become such a hotspot. A portion of Mei’s menu focuses on cocktail snacks such as spicy mixed nuts, crispy fried zucchini strips with cotija cheese and lime ranch aioli, and shoestring french fries with fresh herbs so perfectly fried that it is hard to resist a second plate. Fresh oysters from Island Creek, chilled lobster, and fresh clams perfectly round out the small plates. These snacks compliment the expansive cocktail list which feature whimsical creations including a scorpion bowl made with vodka, gin, plum wine, and pineapple. While the bar serves up a variety of liquors and libations there are also several cans and bottles of beer available. For wine drinkers, the list includes 15 red wines and 15 white wines that rotate on occasion. Sam’s is the only restaurant in the Boston area to serve Domain du Chateu de Pierreclos Macon Pierreclos, a French Chardonnay that is sure to please even the pickiest of wine connoisseurs. Sam’s at Louis is an unpretentious restaurant with food as good, if not better, as the scenic view. With a drink in hand, good company, and a light breeze, Sam’s has turned into a Boston hangout that will quickly become a local favorite. Visit during off-peak hours for its quietest times (after 2pm and before 7pm).